Figuring out where you can use soft seating is pretty simple, because it can go just about anywhere. There is no modern learning space that can’t benefit from some flexible cushy seating. If you want to keep your space relevant and up to date, it’s not a question of whether it is worth your while to invest in soft seating for your higher education institution, but how much to purchase and what kind. Which higher ed spaces should have soft seating? In an ideal world, every single classroom, dorm room and lounge area would have some sort of soft seating. However, being realistic, it is important to prioritize according to the needs of your students, budget and space. The main space where modular soft seating is most useful is in student lounge areas, commons areas and group study rooms. When young adults are hanging out or studying together, it is very helpful for them to have the flexibility of arranging the space according to their needs. Modular furniture is perfect for a college setting because group dynamics and sizes are always changing. Rather than a few groups being forced to sit in close quarters on a few inflexible couches, soft seating allows each set of students to use only exactly the amount of seating and space they need, thereby allowing others to do the same, and thereby maximize the utility of the designated space. What kind of soft seating is best for higher education? It is definitely important to offer some variety. If you have a few spaces where you provide soft seating, make sure you are choosing different colors, shapes and styles. With such a versatile selection, there is no reason to make monotonous choices. An original choice can lend a unique character to your space, drawing students in and encouraging them to collaborate and brainstorm together. However, while almost any shape or style can fit for higher education, you do need to pay real attention to size. If you have standard-height tables in the study space you are furnishing, you probably want at least some of the soft seating to work with those work surfaces. Even if you aren’t coordinating with tables, you still need to make sure that the height is appropriate for college students. What should you keep in mind when buying soft seating for higher ed? 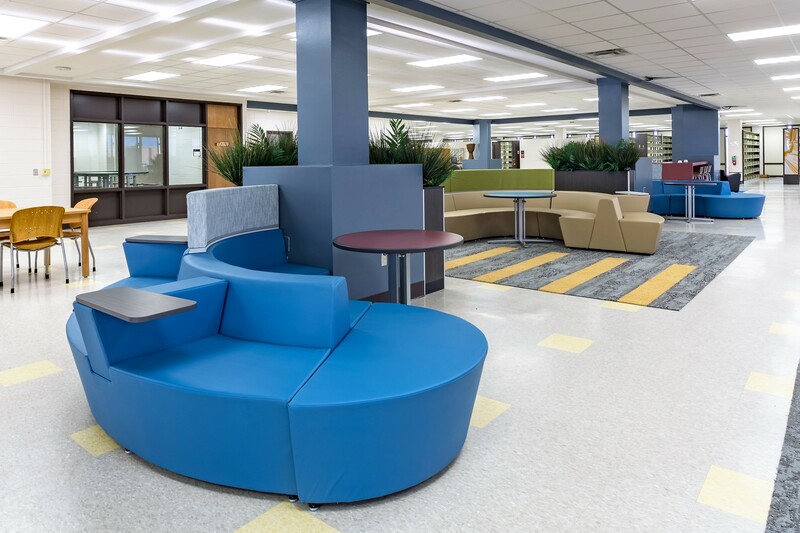 With the high volume of college students working in libraries and study lounges, you want to ensure that the soft seating you choose will look great with continuous use. One important thing to look for is easy-clean upholstery. Chairs that can just be wiped down are the most likely to maintain their luster throughout the years. The thickness and quality of the foam padding also makes a big difference in comfort over time. A seat might look cushy, but if it doesn’t feel nice to sit in, it won’t give students a very nice study experience. Where should you consider adding modular soft seating? There are classic spaces that come to mind, such as libraries and study centers and lounges, when people think about soft seating in higher education, but you can also think outside the box. Maybe consider replacing those rigid wooden dorm room chairs with some of these vibrant, modern pieces. That will definitely send the message that your university is up to date. Soft seating can also be great inside classrooms, and even lecture halls. Even college age students sometimes need alternatives to long and stuffy rows, and this is a great way to provide come flexibility. Some other great places to put soft seating are in commons areas and lecture halls. If you really want to update your large lecture spaces, you can add some soft seating at the front and back of the room. That allows you to utilize the space better, and offer more seating. Commons areas can even be in the little nooks along hallways. They are an ideal place for soft seating, because they might not have enough room for large pieces, but a few compact seats can make a big difference for college students who just want to sit for a few minutes between classes. When it comes to soft seating in higher education spaces, you should feel free to think outside the box. With so many different types of students with different preferences for study spaces and styles, you have a great opportunity to send the message that your institution caters to all types, by including soft seating in some key spaces.